Updated 2012: This was the original announcement and overview of the Arduino plugin for Visual Studio. Since then the plugin has matured with many more features. Please go to our home page for current release information. 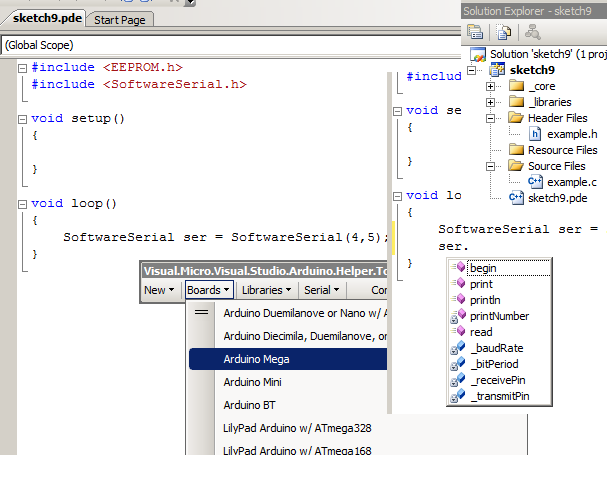 Intellisense for the arduino is provided by Visual Studio. The 'Visual Micro' add-in simply helps to ensure that the files of a .pde project, the arduino core and arduino libraries are registered (or known) to the Visual Studio intellisense system. The add-in is also able to retain board and port settings for each sketch (project). In most cases this means you will select a board and serial port once for the life of each project. That you can work on multiple projects at the same time, each project with its own board and port settings. The add-in provides many other useful features. > Option to open the Arduino IDE loading the active visual micro studio project sketch. > Automatic LINK to arduino cores and libraries. > Simple one click create of .c;.h with #include added to active .pde;.c or .cpp window. > Code example helper makes it easy to create your own code examples for your projects. > Examples/snippets are stored in an xml file in the same location of the code file. Whilst not supported by Arduino or ourselves, the add-in allows you to switch on, at your own risk, "Compile and Upload" features. We have tried to ensure that these features are correct for Arduino and have been using our own boards without problem. We have found the Compile and Upload so useful we decided to leave it in the product (at your own risk! ).